In my last blog post, I provided an overall view of the elements of a proposal and how having a clear, accurate proposal can guard against scope creep. Now, I am going to zoom in on crafting individual parts of the proposal. In this post I will focus on the scope of services portion of the proposal. In the coming weeks, you can also expect detailed advice on setting exclusions, defining deliverables, and preparing estimates. As Bill Beardslee, past-president of the New Jersey Society of Professional Land Surveyors, wrote in xyHt magazine, “Scope stands for Sufficiently, Control, Other, People’s, Expectations.” The scope of services is where you clarify what a client can expect from you. It’s the part of the proposal in which you define exactly what you are going to do to meet the client’s needs. Think of it as a list of tasks you will accomplish on your way to completing the project. It should be detailed enough to serve as a planning document for you and clear enough to communicate your process to someone unfamiliar with the field. If a client thinks they will walk out to their parcel and see it marked with a cord and you hand them a drawing with easements, you are setting yourself up for a conflict. So be clear on exactly what it means to “measure” a lot or “mark” a location. Use accurate and active verbs to convey the work you will do: research title, prepare deed sketch, supply lot dimension, drive eight metal corner stakes on property line, provide locations for bridge pilings. Too long? Too many details? In your first draft, don’t worry if you are providing too much information. You can always go back and make cuts. The length and detail of the scope of services will vary depending on the guidelines in the request for proposal. When preparing proposals for the private sector clients, clarity and concision should be top of mind during your revisions. Driven by a need for efficacy, private sector clients want something they can read quickly. However, the pages are going to add up for your public sector proposals. Being thorough is the most important thing when responding to a public sector requests. They normally come with detailed checklists, and you must respond to every item on this list. One challenge you face in crafting your scope is that you are likely working with a request for a proposal written by someone without technical knowledge of your field. (This is a good thing. If they had someone on staff well-versed in land surveying, they wouldn’t need to hire you.) They might use language that is vague or that means one thing to them and something different to you. Just think of all the different ways a property line can be marked. If they ask for property lines to be “marked,” do they want corner stakes, the boundary traced in spray paint, or drawings on a deed sketch? Don’t be afraid to ask. Set a meeting or give them a call to discuss their exact needs for the project, take careful notes, and make sure that understanding is codified in your scope. The other big challenge is writing proposals efficiently without sacrificing accuracy. You probably have a folder on your computer of completed proposals. Maybe you go through them using the CTRL+F function to find chucks of text to copy and paste into the new document. This takes time and you could be pasting bad or outdated answers. This doesn’t necessarily meet you have to start from scratch. 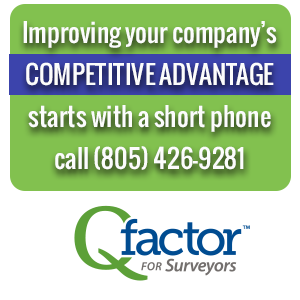 With Qfactor for Land Surveyors proposal feature, you create templates for the common types of projects your firm takes on. Rather than replicating old information, you’ll be starting with a template populated with current data. Make sure other people review your proposal before you submit to look for mistakes or missing information. Use Qfactor to circulate the document internally for edits and approval so you avoid versioning issues. In your scope, you tell your client exactly what you are going to do for them. You can also tell them exactly what you aren’t going to do for them. This aspect of proposals is called exclusions. When and how to use them will be covered in the next post.